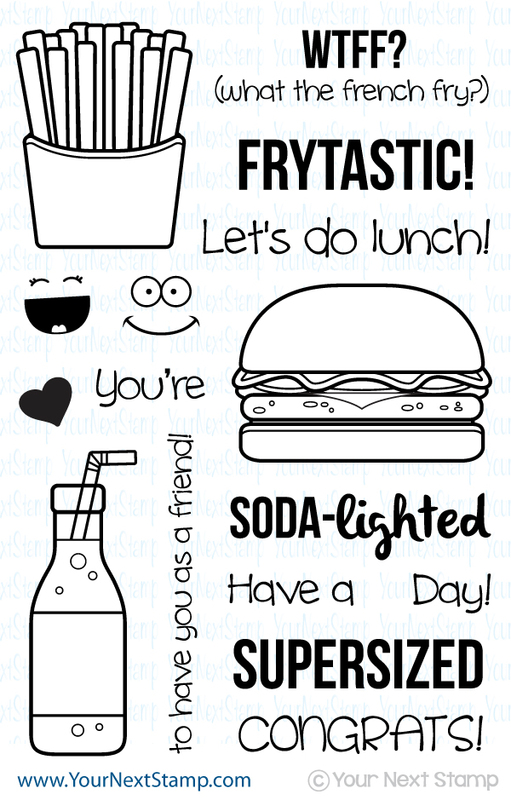 I had a bit of a snafu in Blogger for my last Friday (yes, last Friday) Fun Project with Your Next Stamp, so I am posting this fun shaker card now. I had been so busy with my boys 6th grade promotion, family visiting, my hubby's birthday, and of course Father's Day. It was like a 4 day party in my house! :) With all that was going on, I did not notice this issue, so I suppose it is better later than never! For this shaker, I used the new Whatnots Sentiments Five set for the sentiment inside and the Confetti die to make the confetti with some added sequins. I made this in the traditional way of making a shaker by added foam adhesive and some acetate. The patterned paper is from AC while I framed the opening with a cut out using the new stitched square layered dies. The card was finished with some ribbon, paper flowers, twine, and sequins. Super fun card to make and even more fun using the confetti die to make your confetti in the color scheme you desire. Thanks for taking a peek and be sure to stop by the YNS blog to see the other Fun Projects that were in fact posted in time! :) Have a great one! 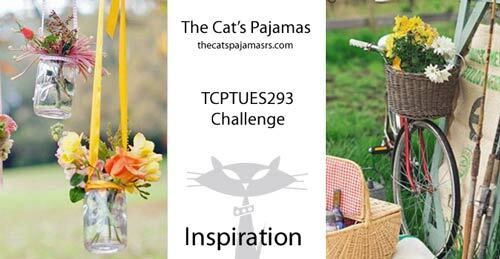 Today is a new challenge over at The Cat's Pajamas and it's a fun inspiration challenge from the ever talented Christine. I just love the set called Besties. 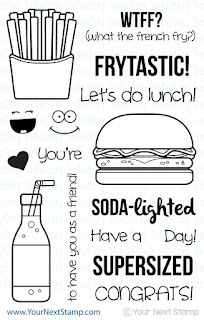 It is a fun set to use for your bestie and perhaps a fun reminder to each other about some fun times you had and I couldn't resist using it for this inspiration. The sentiment cracks me up and thought for my card being a bit impossible to really do in life, it made it even funnier. I started with a blue cardstock base and layered it with black and patterned paper from Authentique's Playful collection. I stamped and colored the image with Copics before fussy cutting it out to be popped up over the patterned paper. I used the new stitched clouds die for the clouds and the word 'fly' from the new stitched fly journal card frame. I finished the card by adding a few flowers from the 5 petal posies die set topped with a rhinestone. Be sure to stop over at the TCP blog to see all the fun and fabulous creation from the Kitty Cat Pack. Have a great Tuesday! Today is the Your Next Stamp Feature Day with the DT and we've been asked to create a card using any of the YNS animals or critters. For my card, I am using the new Quirky Animals Five set . I stamped the image on a stitched square cut out and colored her in with Copics. I popped up the image over some patterned paper from AC Dear Lizzy collection. To complete the card, I used some Divine Twine in Deep Pink and a cutout from the Bookmark/tag die set to stamp the sentiment on and then finished the card with some gumdrops from the new Mermaid Fun collection. 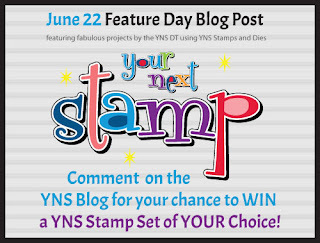 Thanks so much for stopping in and be sure to check out the YNS Blog for more inspiration from the DT and to comment for your chance to win a stamp set of your choice! Everyone loves that! Have a great Monday!! It'a another dare crafty friends and this time the DT was challenged to use yellow or make/use a sun in our projects or cards. Perfect color to use as we all start to hit some really warm days and Summer peeking around the corner. Well, for me that is. School is not out for us here... Just over a week folks! Come on Summer! Here is my card using the new release of Quirky Animals Five. This set is so fun! I stamped out the image and colored him in with Copics before using the coordinating Quirky Animals five die set to cut it out and popped him up on the chunky grass. The patterned paper for the back panel is from Scenic Route and used a plain white background for the main panel. 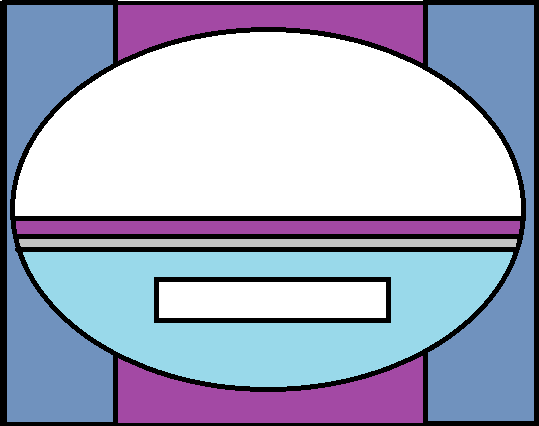 I did go with the making the sun option and I think it is ok, but still not sure how I like it. I punched out a 3/4" circle and used the new Neon Sunrise gumdrops for the rays and finished the rays with some rhinestones. The sentiment was stamped directly onto the main panel and finished some clear Wink of Stella over the wings. 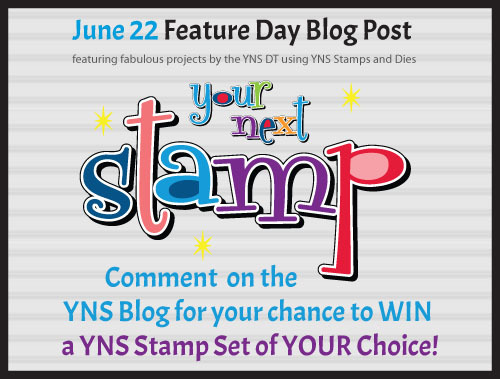 Be sure to stop by the YNS blog to not only see the other fabulous creations from the team, but if you leave a comment, you can win a YNS stamp set of your choice!! Woot! Thanks for stopping by and hope you have a great Wednesday! 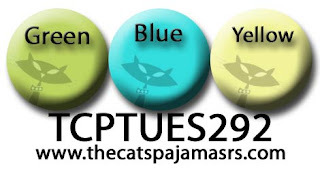 It's time for another TCPTUES challenge and this time it is a color challenge. I was happy to be the host of this challenge by picking the fun colors to play along with. I have summer and the beach in mind, so I couldn't resist these colors to be used. For my card, I used an unknown blue card stock for my base which I then ran through my swiss dots CB folder for the background. The image is from the TCP Oh Chute! set that was stamped, colored in with Copics, and cut out to be popped up with foam squares. The clouds are the new, fun stitched clouds die set that are popped up as well. For the sentiment, I carefully inked and stamped the sentiment onto the banner image and then cut out and popped up as well. The card was finished with some twine. Be sure to stop by the TCP Blog for more inspiration of this color combo and to link up your project for a chance to win! Thanks for stopping by and have a great Tuesday. The day has arrived... It's the Your Next Stamp June release Blog Hop! I hope you all enjoyed the sneak peeks yesterday and have your shopping list ready because there is a sweet deal Karen put together for your shopping pleasure. I have two cards to share with you made with two different release sets. And one is a great masculine (or feminine) set perfect for that golfer in your life! 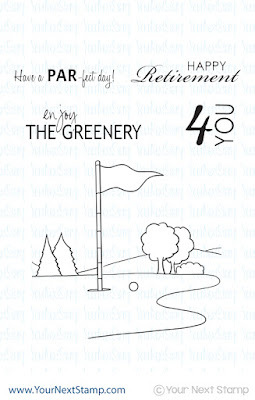 It is called Golf Scene. The background sky and ground was airbrushed using my Copics and Copic airbrush system. It was first stamped and then masked to be airbrushed and the green colored in. The panels were cut out using the YNS stitched rectangles die set with the sentiment stamped directly onto the scene. For my second card is one using the Happy Meal set. This set is so much fun and has a coordinating die set. I made a CAS card using the YNS stitched circles and plain circles die set. The image is popped up and finished with some NEW fun, yummy gumdrops that you sure do not want to miss! Now, check out the great deal ready for you to use on your shopping excursion for all the sets and gumdrops on your list! Don't forget to check out the other fabulous creations from the DT and be sure to leave a comment along the way for your chance to win! 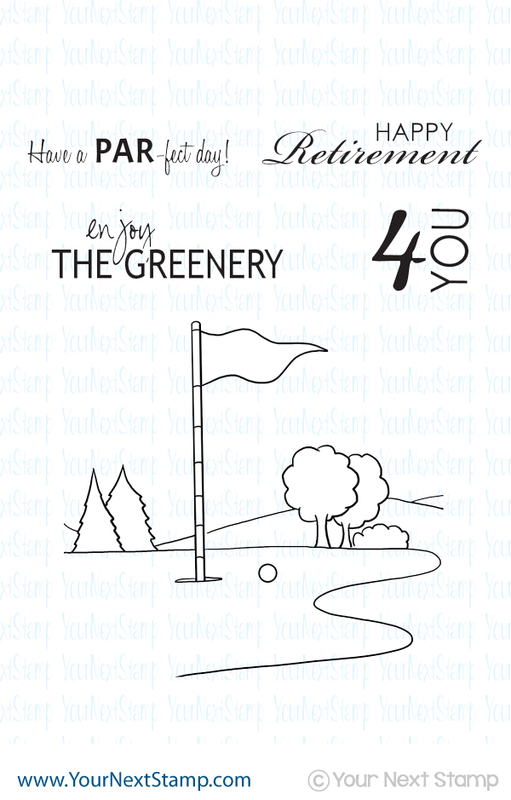 It's time... well almost, but today is the sneaky peek for the Your Next Stamp June release. Another awesome release full of fun and cuteness! So start with the peeks and stay tuned this weekend for the fun new release blog hop. You don't want to miss that and even win a prize. For my peek, I created a fun project using the new set of Happy Meal and the coordinating die set. Can you just guess without looking what this set consists of? :) It is so much fun. 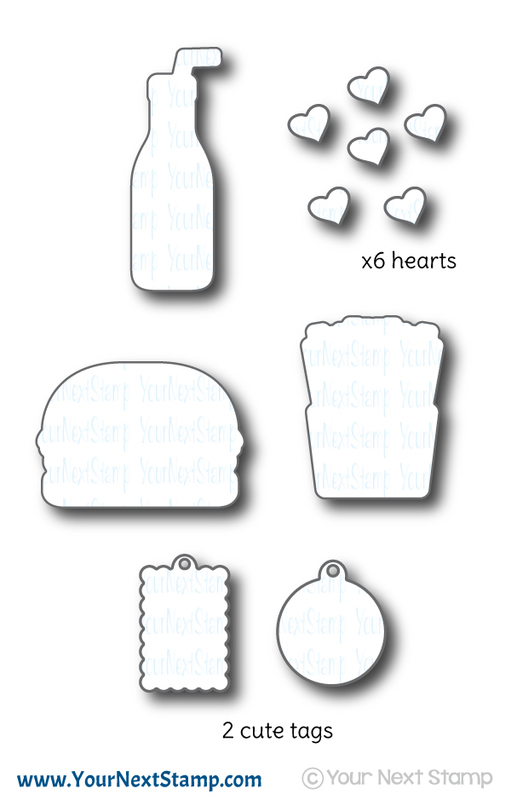 So for my project, I started with those fun new bottles of soda you can find and used the YNS Bookmark dies to make the base of the tag. The image was stamped, colored with Copics and cut out using the coordinating die before popping it up with foam dots. I created my own little 3D banner to be at the top with the sentiment before inking up the rest of the sentiment to be broken down so it would fit onto the tag. It was then finished with some hearts cut out from the die set, popped up, a paper straw, and some ribbon. Ready to give! I hope you enjoyed this fun sneak peek and be sure to stop by the YNS Blog for more fun projects the DT has come up with. Enjoy your weekend and don't forget to check back tomorrow for the fun release hop!! Today is a new sketch challenge over at Friday Sketch Challenge. It's a good one and perfect for those long/tall images. For my card, I am using an image from our Sponsor Zuri Artsy Craftsy called Nidia. So super cute! I colored the image with Copics and added some Wink of Stella for some sparkle on the bubbles, earrings, and sentiment. The shoes and bracelet were touched with a glitter gel pen. The patterned paper is from AC while the others are scraps from my stash. 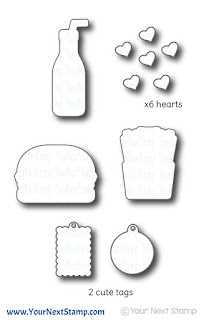 The sentiment die cut is one from Your Next Stamp called Scripty Words. I just love those dies. The image was popped up using some foam dots. Be sure to stop by the challenge blog to link up your project and be entered to win from our sponsor. You can also check out the fabulous creations from the DT that they did with the sketch! Thanks so much for popping in! Have a great weekend! Today is another Friday Fun Project with Your Next Stamp and I couldn't resist picking up the new release set of Woodland Cuties. I also used the current sketch, which did you know? You can play along with, link up, and have a chance at winning! We can't wait to see what you come up with to share with YNS. For this card, I stamped the image and colored him in with Copics before cutting him out with the coordinating die set. The patterned paper is from MME and being double sided, I was able to use the coordinating side for the center strip. The image was popped up over the strips and I used the mini balloon trio die set to add and finished the card with some yummy gumdrops in ivory and the sentiment stamped directly onto the oval panel. Be sure to stop by the YNS Blog to see all the other fabulous creations the DT has done and also see the inspiration for this current challenge that can be used. You also do not want to miss stopping by tomorrow for the SNEAK PEEK of the June release happening this weekend!! WOOT! Always a fun time to see the creativity the talented team puts together. Thanks so much for stopping in and hope you all have a great Friday!